Hotel Le Bourgogne & Montana: the 'don't ask, don't tell' one. 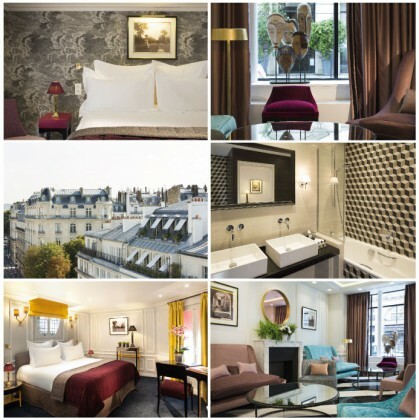 It is one of the most discreet hotels on the left bank, almost within touching distant of the Hotel Matignon. If you follow the muffled hubub of the Place Gaveau, you come across another, undiscovered side of Paris, far from the tourist circuit, and this newly renovated hotel. Within walking distance, why not take a stroll and check out an exhibition at the musée Rodin, wander over to the other side of Invalides, take a trip to the buzzy 7th arrondissement, to Rue Saint-Dominique and Rue Clerc. On the inside, the place is chic and sufficiently elegant to make you want to hide away in your room. Even the bathrooms are aesthetically pleasing, with their graphic vintage checks. We love: the very deco wallpaper and the arrangement of unusual volumes in the bedrooms. Discretion is a must in this tranquil, affluent hotel and room-service is extremely efficient. Perfect for a ‘hideaway’ stay, without even leaving your bed! Our favourite bedroom: one of the ‘Seductive’ rooms, with a coquette vibe and a view over the rue de Bourgogne. It’s all just too much: the indulgent, high quality breakfast spread, with Milliat juices, delicious viennoiseries, Echiré butter, coffee on demand, a mature cheese platter and handmade jams.